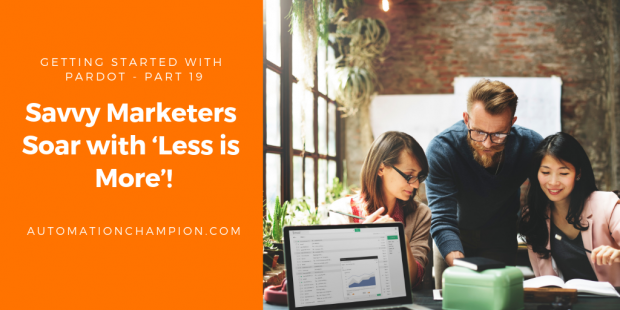 You are preaching to a choir if you are advocating ‘less is more’ to a savoir-faire marketer! Marketing automation tools are delivering ROIs beyond expectations. The tools are enabling seasoned marketers to (1) create content for their website with ease; (2) generate relatively relevant high-volume leads; (3) foster Email marketing; and, (4) leverage the power of segmentation and scoring to winnow out less than promising leads. Keenly aware, that none of the automation magic would eventuate with stale leads, astute marketers guard, quality and quantity, of their leads like a hawk! And, you should too! My prospect limit in Pardot overreached, what options do I have? I’m ready to reduce my prospects – what next? My list doesn’t have good open/read % rate – please help! Ah! Mailable prospects – ones, that can receive emails from Pardot because either they have (1) not unsubscribed;(2) have not had (one) hard or (five) soft bounces; or (3) have not manually opted out. Pardot only counts mailable prospects as part of database limit. Crossed Mailable Prospects Database Limit? Now What? Purchase additional storage for burgeoning list of prospects. Prune excess database contacts within 10 business days. However, the keyword in the options listed above is ‘stop-gap’. Because, until and unless you optimize your list, you will continue to encounter storage issues. In this article, we will discuss various optimizing strategies so that you can build a robust mailable prospects list and, simultaneously, avoid hitting against the database limits. Get Notified Before Exceeding Mailable Prospects Database Usage Limit! When you approach your database limit, Pardot starts displaying a message within the in-app message as follows. And, Pardot sends ‘exceeded database limit’ notification – about renewal notices, usage limits, database size – via email (as shown in the preceding screenshot). The email is sent to (1) your account’s point of contact; and, (2) to a user with import prospect permissions who logged in most recently. Now click on the Mailable prospect link to view all mailable prospects. If prospects have not engaged with your contents or emails in few years or even months, then, it’s time to re-evaluate their value! Ask yourself – are these prospects cluttering the database? If so then, better to remove, or unsubscribe, them from your mailable prospects database. Delete mailable prospects and move it to Recycle Bin:- Simple, straightforward and easy! Mark mailable prospects as Do Not Email:- Select this option if you want to keep and track prospects’ actions. That is, you want to see it under prospect table but don’t want to send future emails. Your decision to opt for one of the aforementioned steps will, and should, depend on your marketing strategy. However, my recommendation is that you opt for the first option. Let us start with a business use case. David Haditsch is working as Content Marketing Manager at GurukulOnCloud. GoC is currently using Pardot to nurture prospects. Today, GoC received an email from Pardot stating that “Your account has exceeded database limit“. As a savvy marketer, David, and his team decided to delete all prospects -that have not opened any email the in last 180 days – and move it to Recycle Bin. Use Automation Rule to add all prospects (that have not opened an email in last 180 days) into the list. Use table action for the list to delete prospects. Then click on the + Add List button to add a new list. When finished, click on the Set Rules button to set criteria for the Dynamic List. Once you are done with all the changes, the final step is to click on the Run Rules button, to save the list and run the rule. Now we will use table actions to delete prospects that did not open any email in the last 180 days and therefore, are added to the dynamic list. Pardot will now move all selected prospects to recycle bin. Things to remember:- The process which displays the in-app message or under database limits – only updates once a day so it can take up to 24 hours for it to catch up and clear out. For the time being, reviewing Mailable Prospects in your master prospect table will be the best way to get an accurate database count. I hope you have learned something new today and understand how to manage Pardot’s mailable prospects database. –> Please feel free to add constructive comments and insights to the blogs.